We all love automotive art, and I'm especially excited to report that some good old everyman trucks have finally been selected up as the subject of artistic rendering! These images were all created in free computer drawing programs by self-described "car/truck fanatic" Zach Snow. He told us he loves drawing vehicles, and bases his images off photographs he takes. He also mentioned he finds peace in nature photography. "From start to finish one drawing will take me anywhere between 90 minutes to 4 hours depending upon the intricacy of the initial photograph I am drawing. I usually draw every image twice to get it exactly how I want it unless the first time turns out perfect," he said. You'll probably recognize that red Hilux from Top Gear, and the others are common sights on American roads. I like the way these images take realistic images and slap them around a little with abstraction. Snow draws all kinds of vehicles, but here's a selection of Truck Yeah! favorites from his catalogue. His artwork has appeared at dealerships and on Mazda Laguna Seca's social media sites. 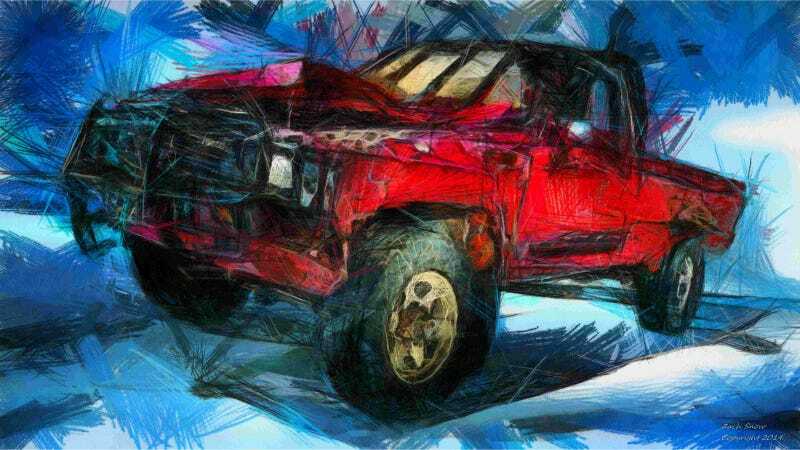 If you'd like to order a print or see if you can commission a render of your own vehicle, drop a line to Snowstorm Artwork.